Letters & Videos – Thomas Graham, Jr.
Graham, Thomas, Jr. with Susan Burk, Richard R. Burt, Thomas Countryman, Jill Hruby, Arlen D. Jameson, Nancy Kassebaum, Laura E. Kennedy, Richard Lugar, Sam Nunn, William J. Perry, Thomas R. Pickering, Joan Rohlfing, and George P. Schultz. Letter to President Donald Trump on INF Treaty Compliance and new START Renewal. 7 Nov. 2018. Graham, Thomas, Jr. Letter to Benjamin Rhodes. 7 Sept. 2016 with Graham, Thomas, Jr. Letter to President Obama. 9 July 2016. Graham, Thomas, Jr. Email to Jon Wolfsthal. 10 July 2015. Graham, Thomas, Jr. Email to Benjamin J Rhodes. ” UN Security Resolution Banning Nuclear Weapons Testing.” 10 July 2015 with Letter to Jon Wolfstahl 10 July 2015. 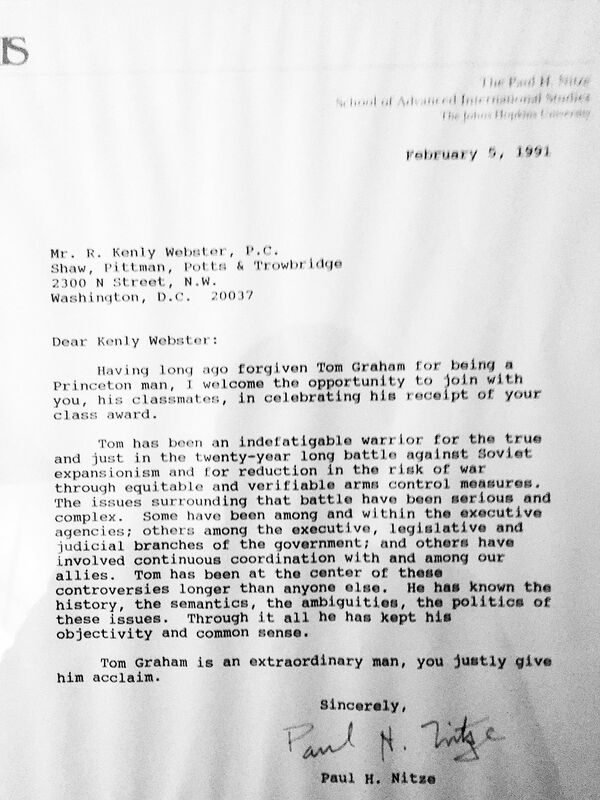 Graham, Thomas, Jr. Letter to Tony Blair, Prime Minister. 14 June 1999. TS. Jan Eliasson. Letter to Thomas Graham Jr. 25 Sept. 2015. Tony Blair. Letter to Thomas Graham Jr. 18 April 2000. James A. Baker, III. Letter to Thomas Graham Jr. 11 Feb. 1991. Paul H. Nitze. Letter to Kenly Webster. 5 Feb. 1991. “US Strategic Nuclear Policy: An Oral History, 1945-2004” (Part 1). Sandia National Laboratories. “US Strategic Nuclear Policy: An Oral History, 1945-2004” (Part 2). Sandia National Laboratories. “US Strategic Nuclear Policy: An Oral History, 1945-2004” (Part 3). Sandia National Laboratories. “US Strategic Nuclear Policy: An Oral History, 1945-2004” (Part 4). Sandia National Laboratories.